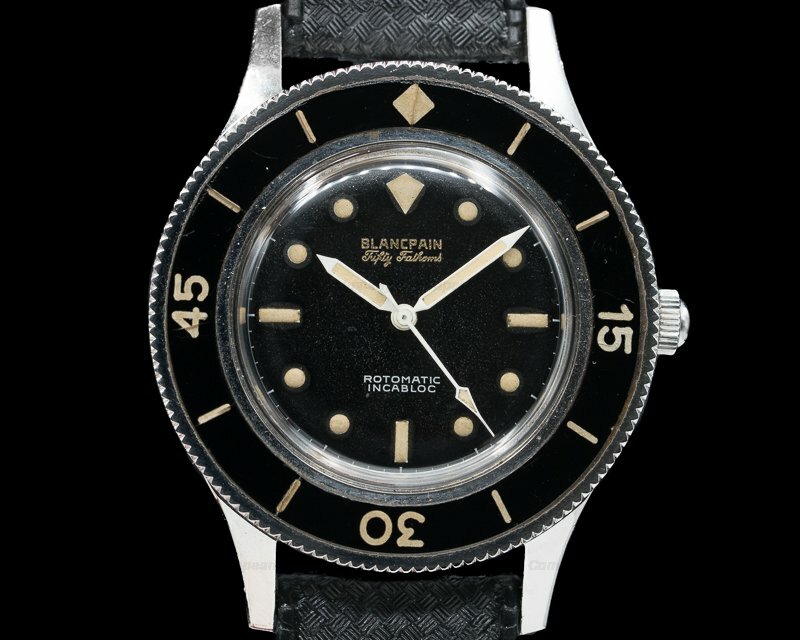 30204 Blancpain Milspec 1 Fifty Fathoms Circa 1959, one of the first military recreational diving watches ever made in the 1950s and an incredibly important piece of history, the stainless steel brushed case is in exceptional original condition with original bevels still in tact, 3 piece case, automatic AS caliber, radium is in original unaltered condition and is exceptionally clean for its age, dial and hand radium is original to the watch, moisture indicator at 6 o clock has aged uniformly with the dial, outer minute track, single siwss at 6 o clock, gilt Blancpain Fifty Fathoms writing, Milspec 1 in white, original bakelite bezel is in outstanding original condition and is free of cracks, crystal appears original as it shows signs of crazing, acrylic crystal, dust cover signed by Blancpain, caseback signed "Blancpain, Milspec, Automatic, Waterproof, Antimagnetic, Shock Protection," Size 41mm, thickness, SN 25XX, Outstanding Original Condition for a rare and early Blancpain Fifty Fathoms Milspec 1 reference and an important addition to any vintage watch collection. 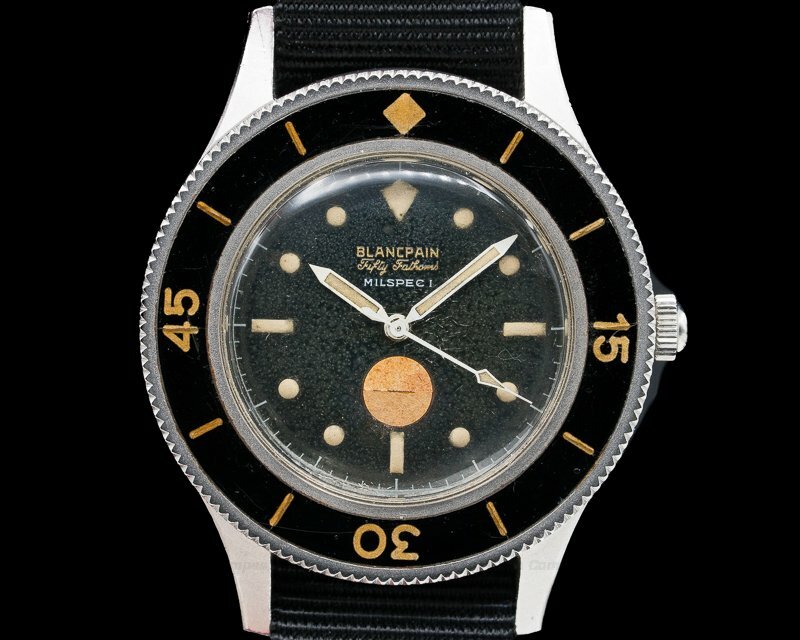 This Blancpain Milspec 1 Fifty Fathoms has an automatic Blancpain caliber AS 1361 movement that's rhodium plated. 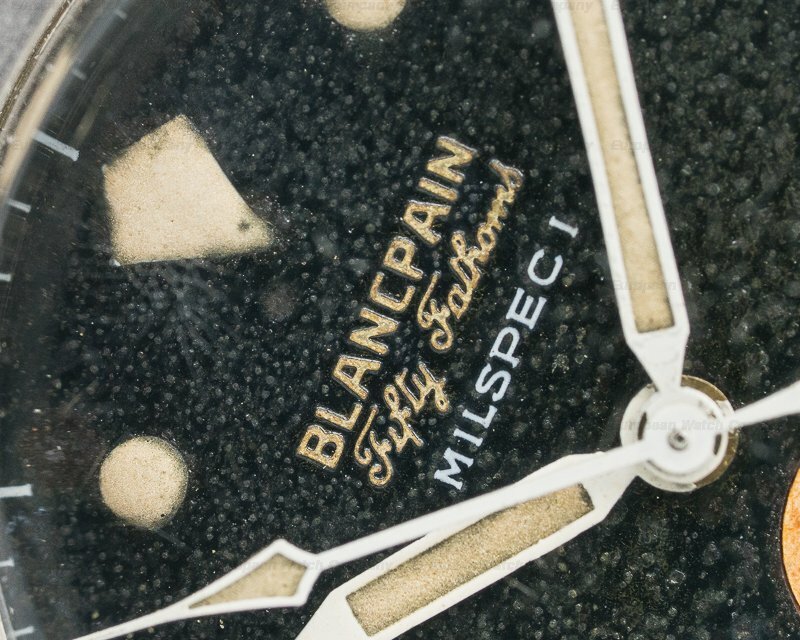 It's constructed with 17 jewels, an Incabloc shock absorber device, and a straight-line lever escapement. 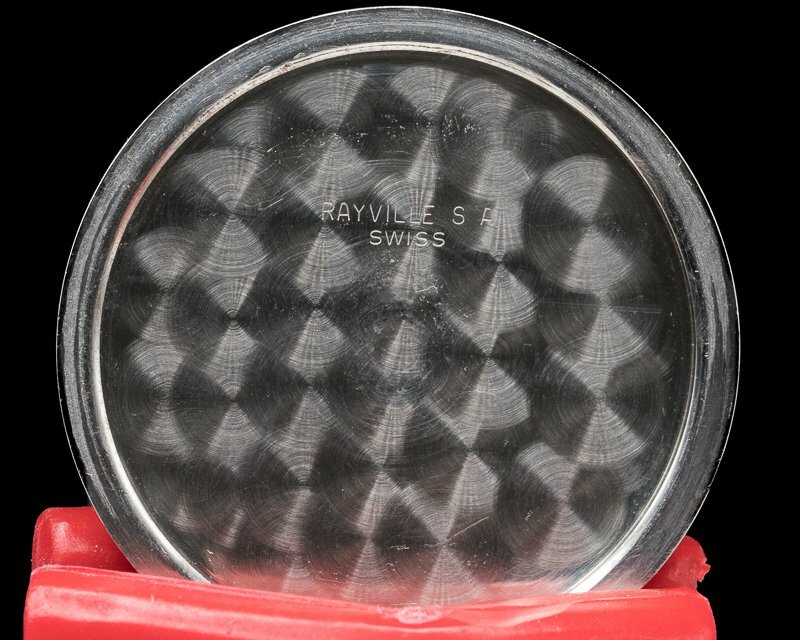 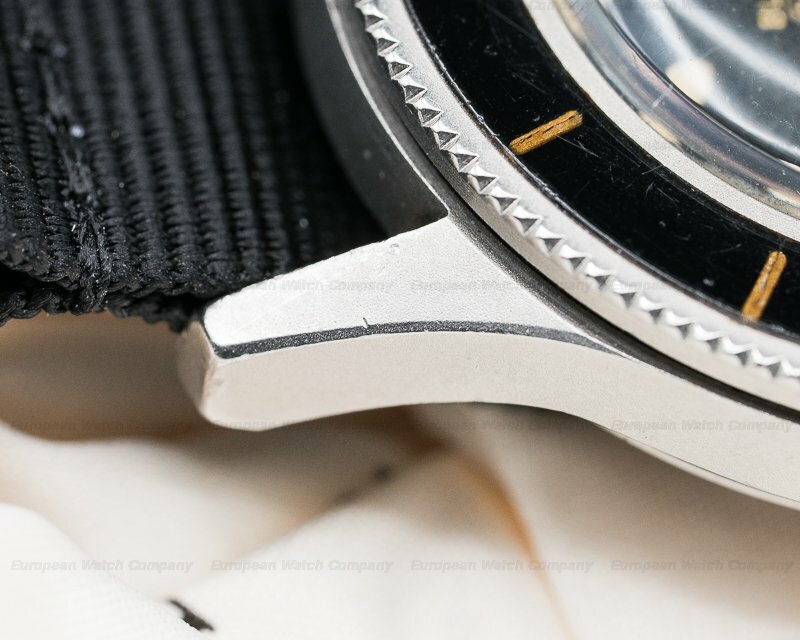 It includes a monometallic balance, a weighted rotor, and a self-compensating flat balance spring. 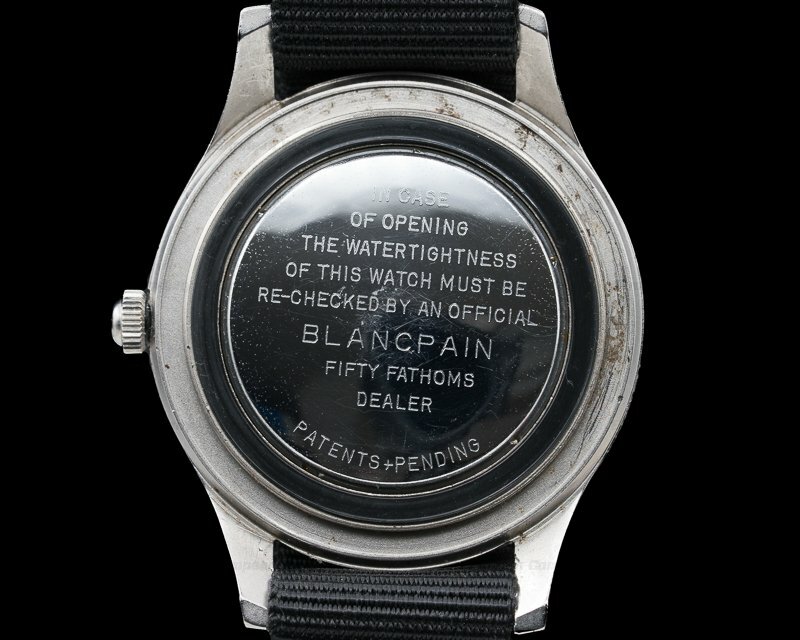 It includes a hacking small seconds device for precision time setting. 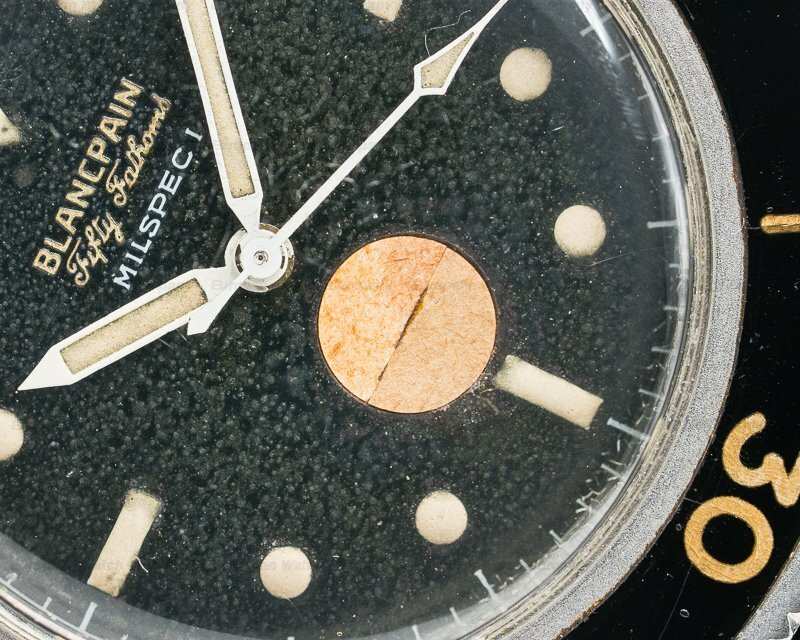 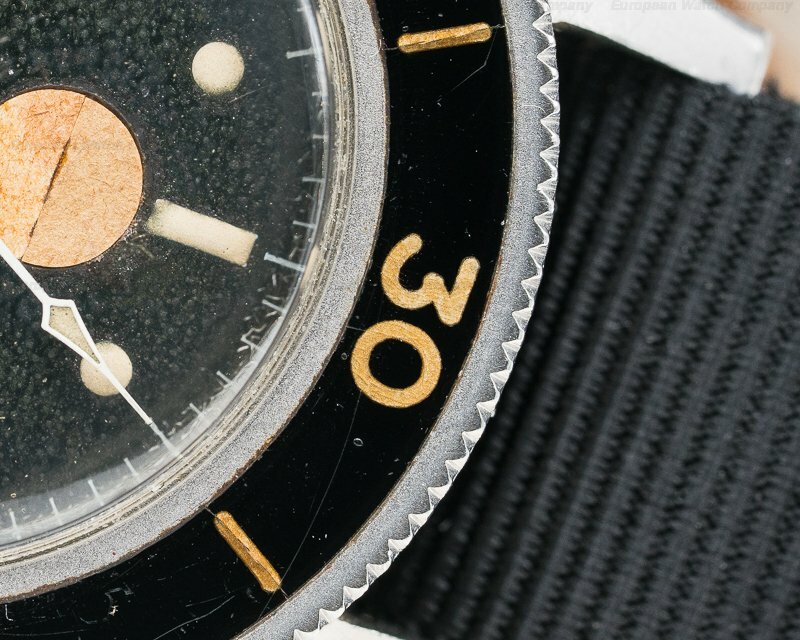 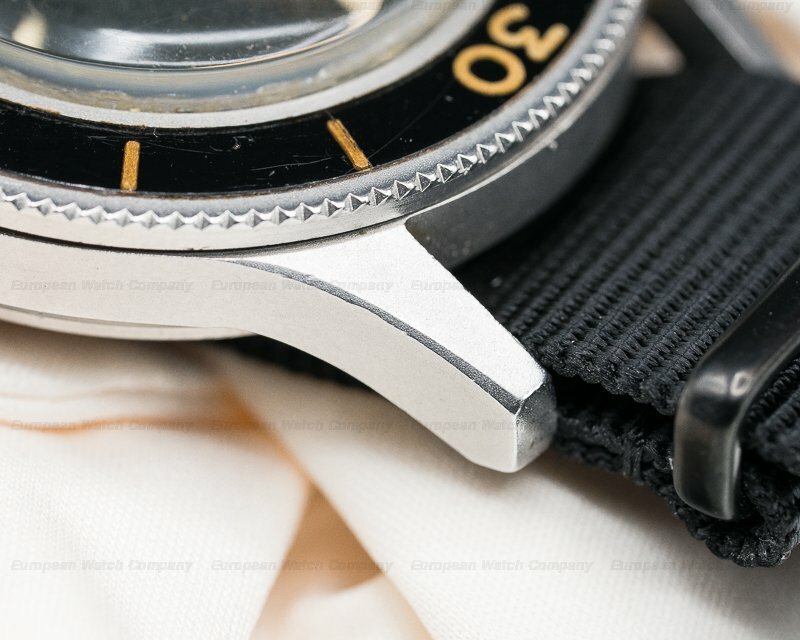 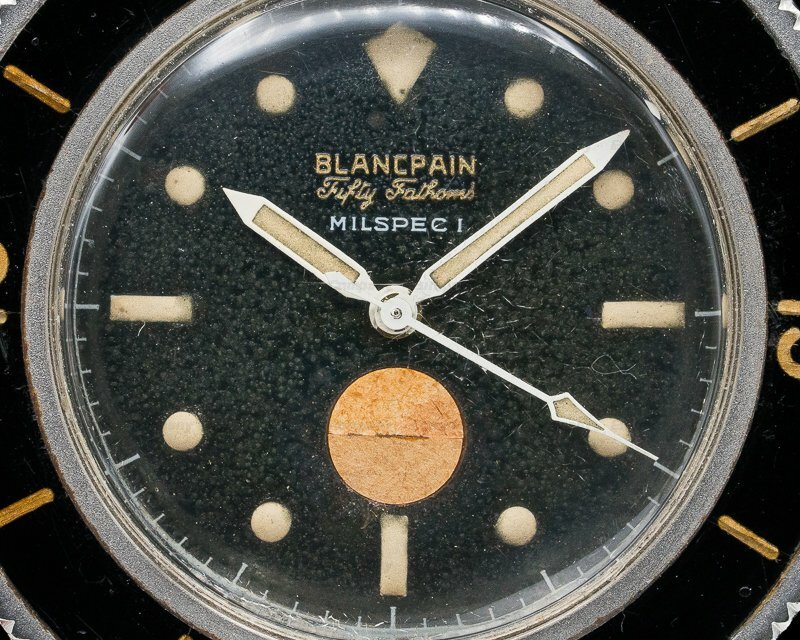 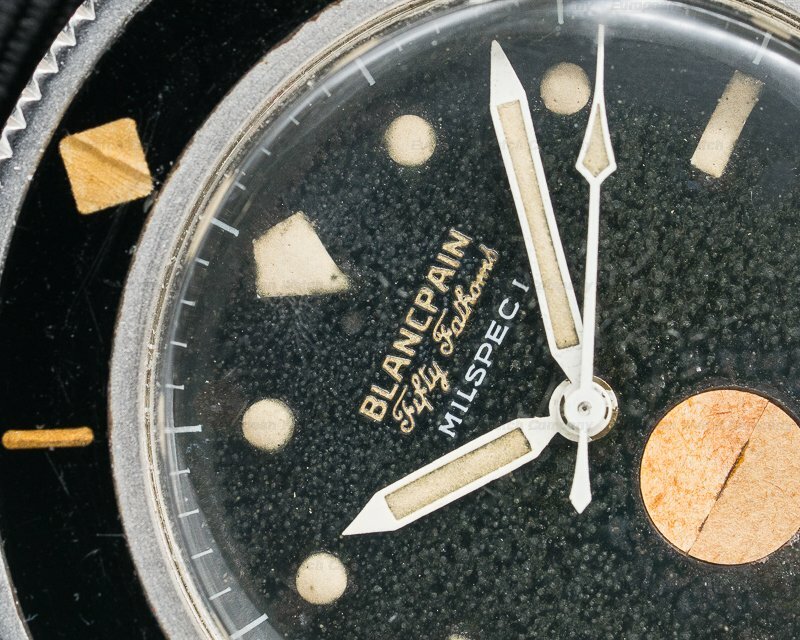 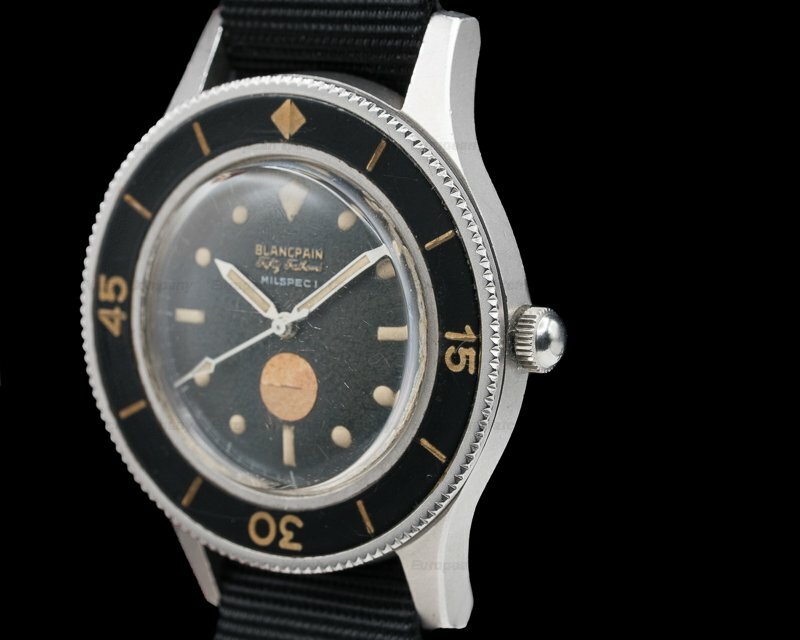 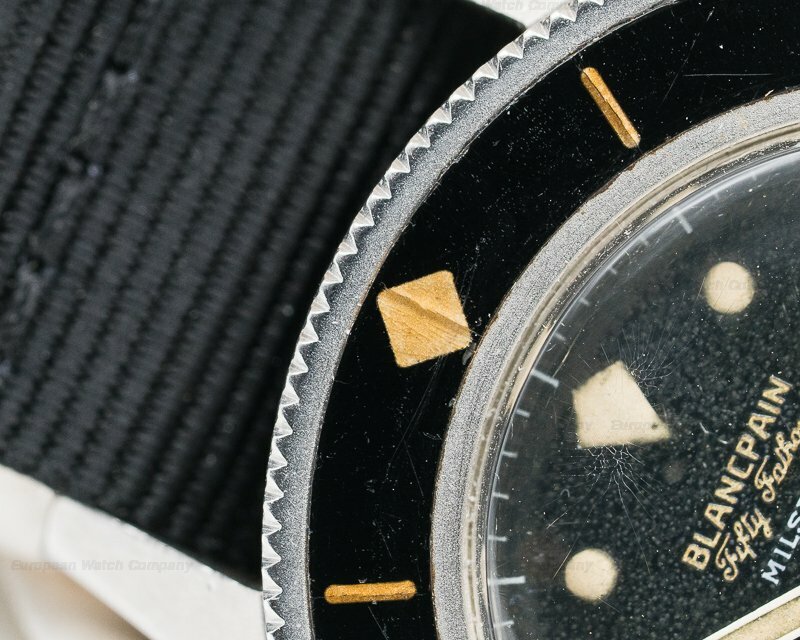 The Blancpain Milspec 1 Fifty Fathoms was introduced in 1957-58. 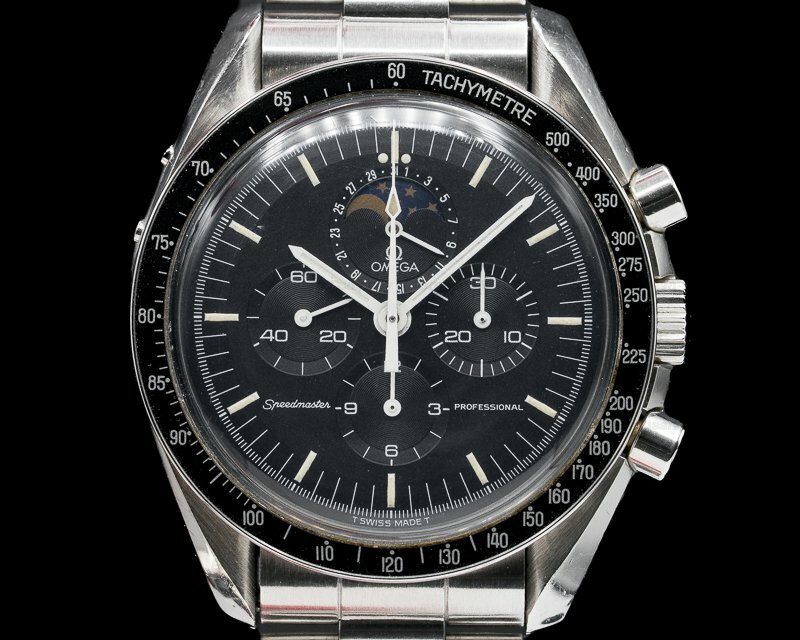 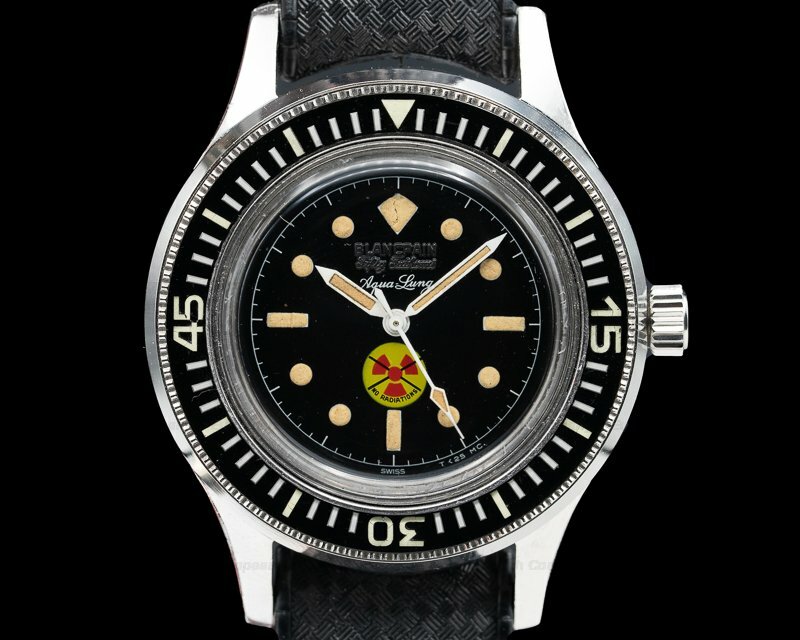 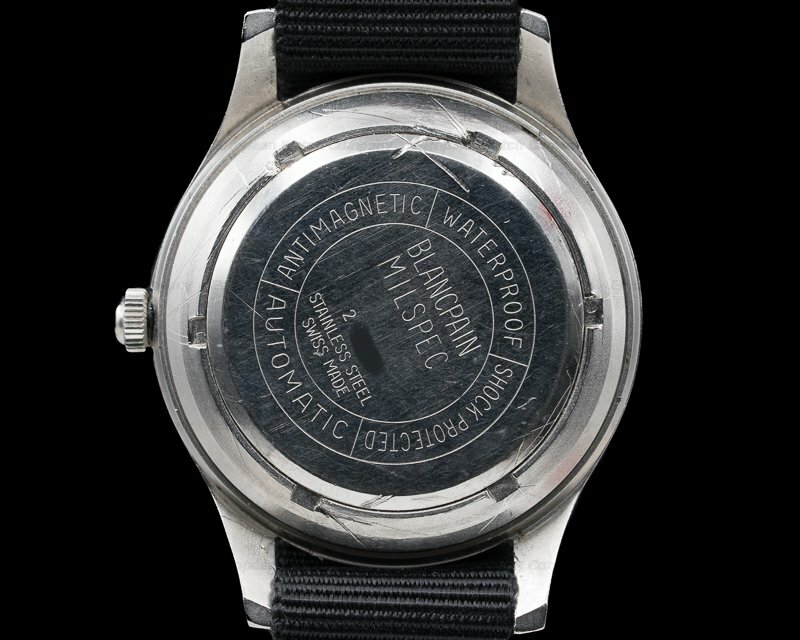 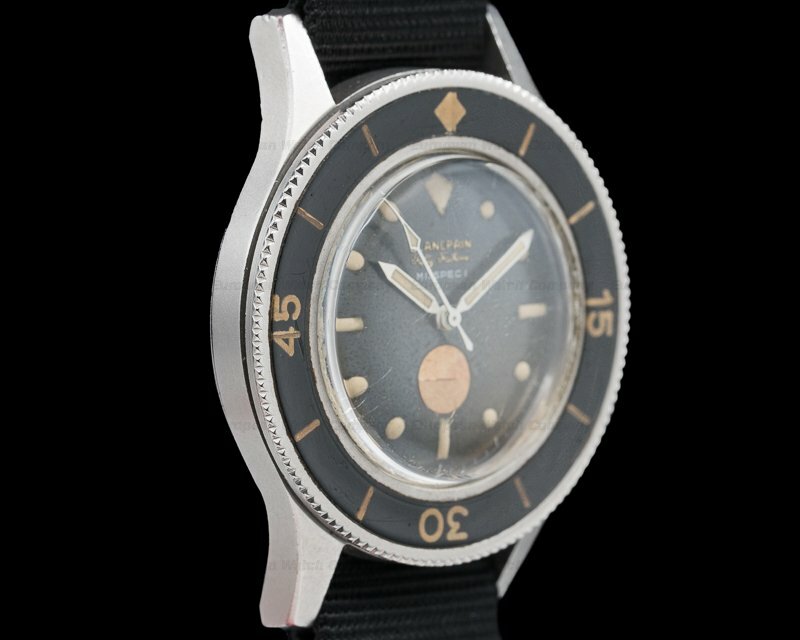 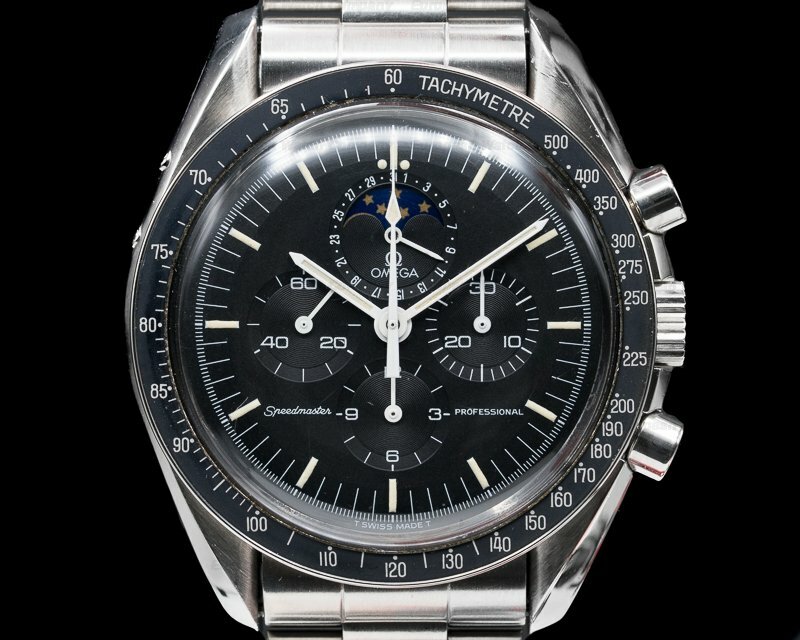 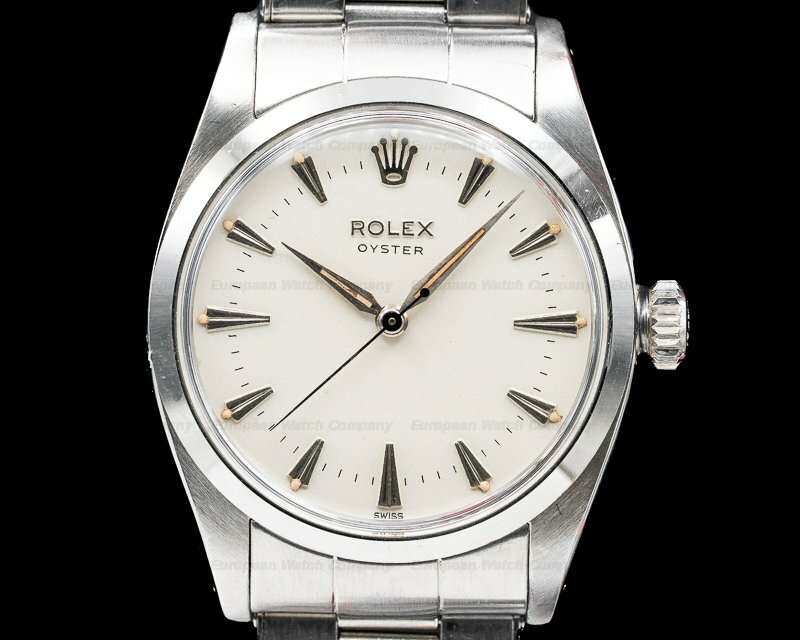 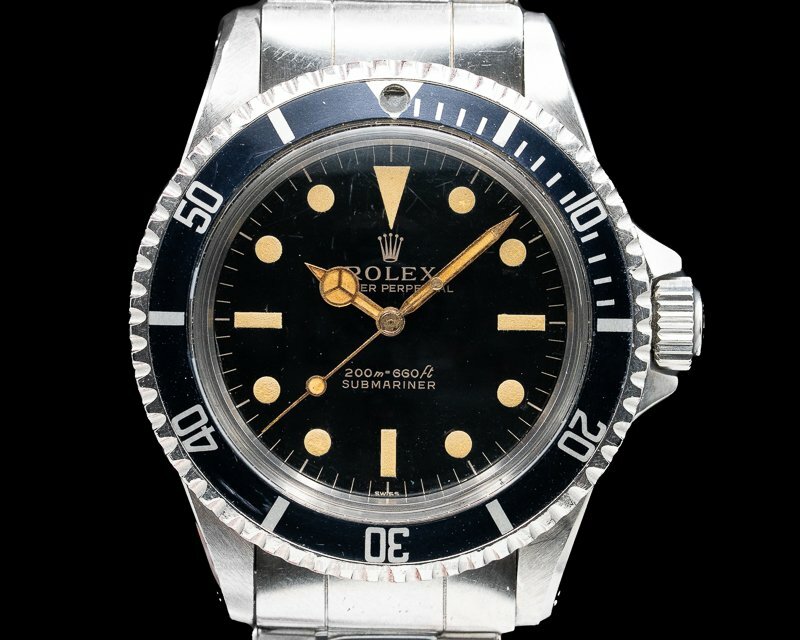 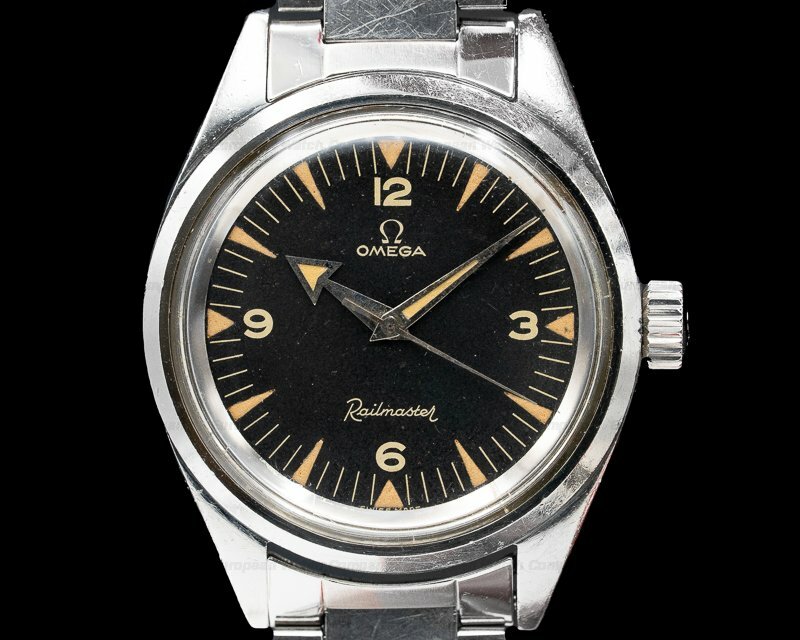 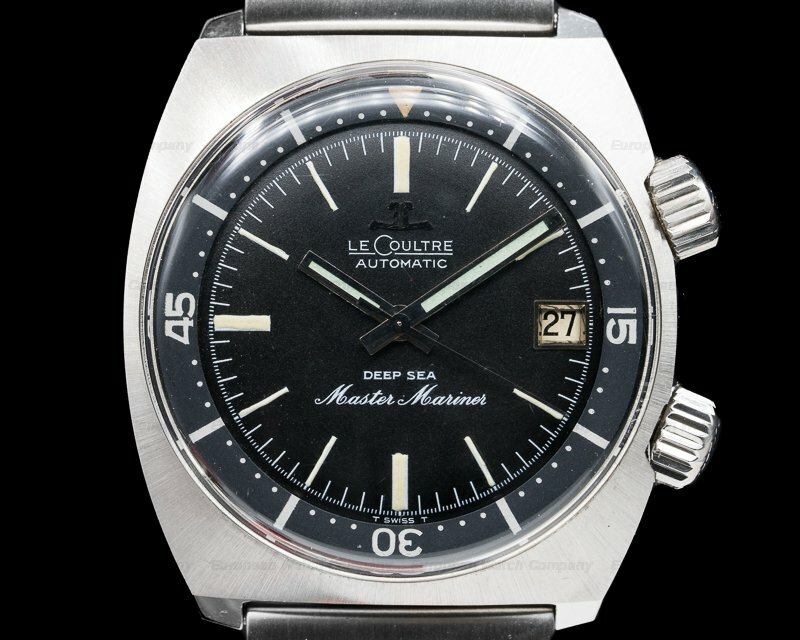 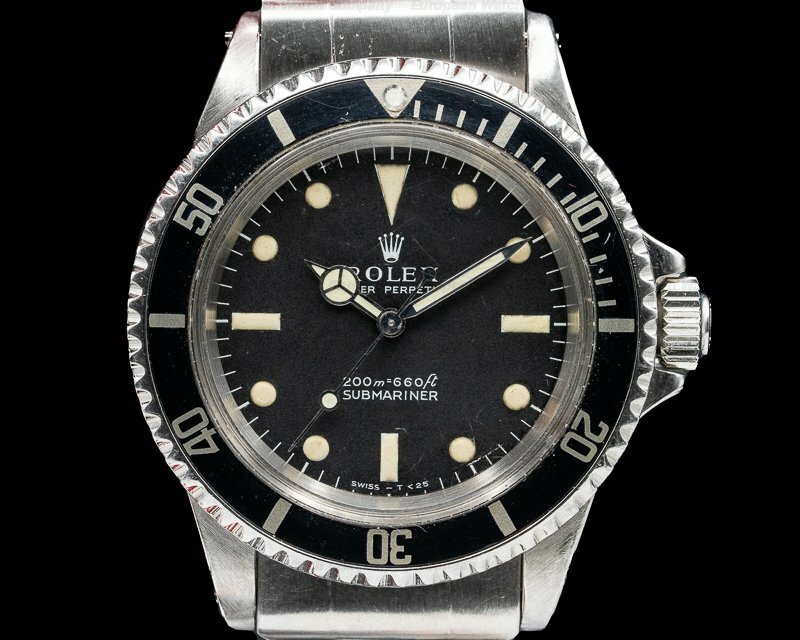 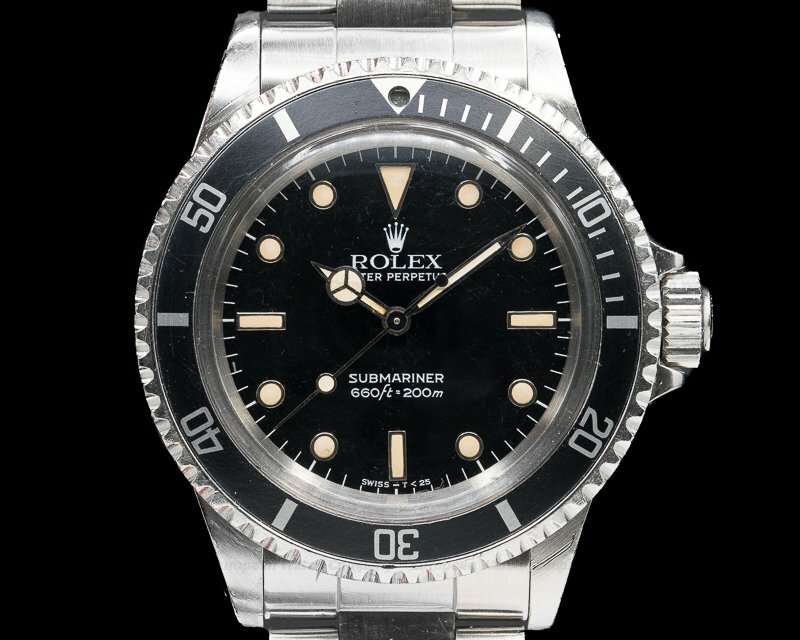 It became the standard-issue watch for U.S. Navy combat swimmers in 1958. 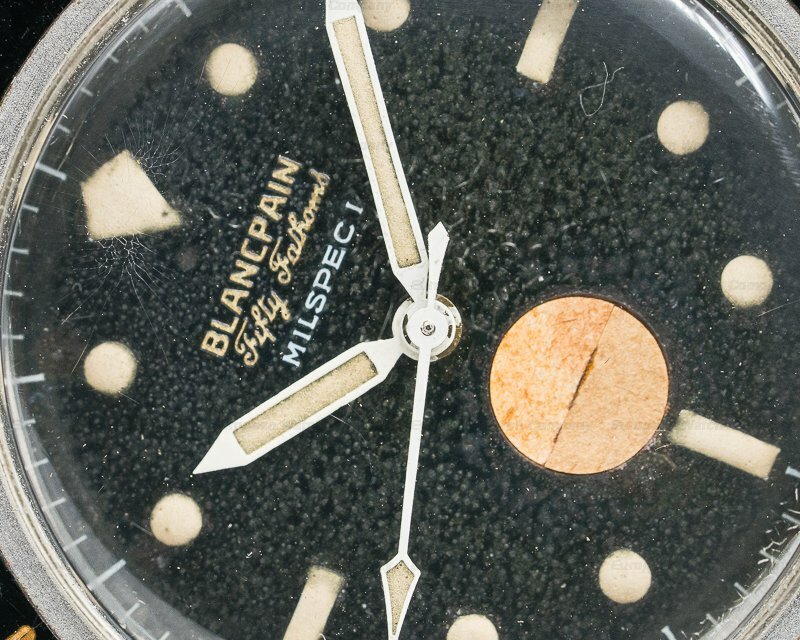 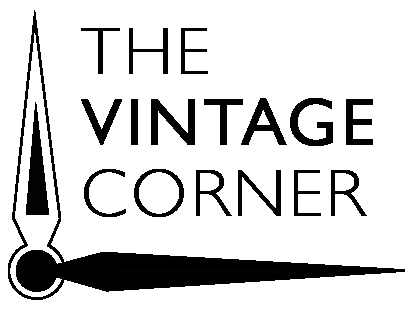 This is a rare, early example.